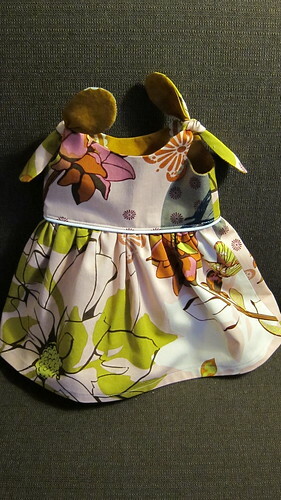 There is no way this dress will fit our little girl next year, but since I both started and completed it this Easter Sunday - it's officially an Easter Dress. Fabric: Anna Maria Horner Drawing Room (dress) and Little Folks Voile (lining) all from my stash! Modifications: I sewed the lining and bodice together so that the seam was hidden, the directions weren't really clear so I just did what I thought looked best. I also serged all the seams and hemmed the skirt instead of using bias binding as instructed. 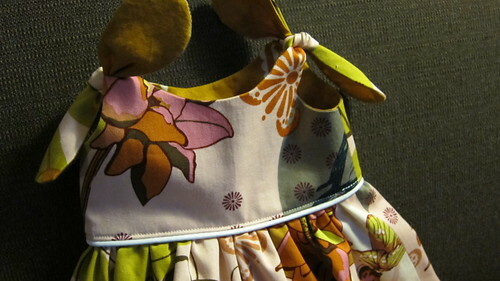 Finally I top stitched above the piping to tack down the skirt/bodice seam. This is a really easy pattern that comes together quite quickly. It took me longer to clip the curved seams and turn the ties right side out than it did to actually sew it. I'm hoping this is a contender for a "coming home outfit" - we'll see how big she is. I've also got an Oliver + S pattern in the queue to as another option, but I'm afraid the 0-3 month sizing will be a little big. Awww! You look fantastic!!!! And the dress is cute too. :) So glad you posted a picture of yourself! Miss you! 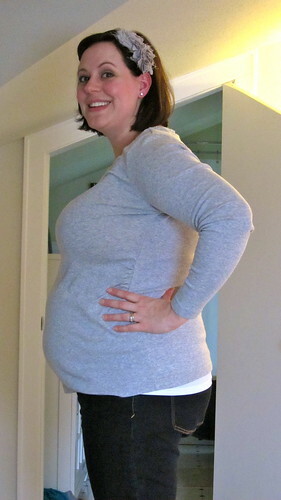 25 weeks! And a little girl! I am so excited for you! You look adorable!! Can't wait to see you!